Programs - Exceptional Equestrians of the Missouri Valley, Inc.
Up to 60 minutes of direct treatment time. 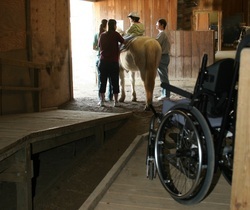 Includes mounted (hippotherapy) and/or other equine-assisted therapy tasks. Monday, Tuesday, Wednesday, Thursday and Friday early morning through late evening. EE runs in various semesters throughout the year. In 2019, we will offer a total of 4 semesters, 1 semester for each season. The full, annual calendar is available HERE. In the summer, we will offer a variety of integrated summer camps in June as well as therapeutic riding sessions in July and August. For maximum development, a participant is enrolled in a specific day & time and will have the same schedule throughout the semester. For example, a private session may be from 3:30-4:00 pm on Mondays. Participants can register in the middle of a semester if the schedule allows. click here for information on the equine assisted therapy program. Exceptional Equestrians strives to provide affordable therapeutic intervention. The therapeutic riding program participation fee is $35 per session. This is about 1/3 of the actual program cost. We also strive to make sure every individual who needs services is able to receive them. Through the generosity of private and public donors, we are able to provide financial assistance to those who qualify. Thank you for valuing our service.